Our Cruden Bay Florists are incredibly passionate with a strong work ethic which is why we want our customers to know that no matter how big or small your request is, they will always do their absolute hardest to fulfill all your wishes. 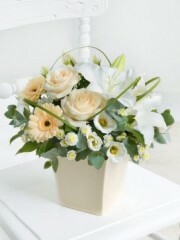 One such way they aim to do that is by offering to organise for a gift to accompany your gorgeous flowers. We have a gifts range on offer here which is incredibly versatile and can be used for any and all occasions. This gifts range includes a selection of delectable wines and champagnes all rich in taste which can be used, for example, as a gift for someone's birthday or to accompany a romantic dinner; adorable teddy bears perfect for new born baby events; luxurious Belgian chocolates if your loved one has a sweet tooth; fruit baskets in different sizes that come filled with an array of fruits; gorgeous smelling candles as well balloons. Our Cruden Bay Florists can arrange the balloons into a lovely balloon bouquet that is usually composed of three plain balloons and three balloons with a message fitting for your specific occasion. We hope that our gifts range here will be able to make your recipient feel that extra bit special and thought of as well as creating lasting memories of their special occasion. Our Cruden Bay Florists hold you, the customer, as their number one priority which is why they want to do as much as they possibly can for you so your order with us is as fuss-free as possible. As we are first and foremost a flower shop, our Cruden Bay Florists can arrange the most stunning bouquets suitable for any occasion. We are able to cater for occasions such as birthdays to congratulatory events all the way to larger-scale occasions such as weddings and funerals, so no matter what you're looking for, we are positive our Cruden Bay Florists are able to provide you with the perfect bouquet. All of our flowers are the highest quality as they have been directly imported to us all the way from our cultivators in Holland and with up to four deliveries per week from our suppliers, our flowers are also the freshest. This means that our bouquets have a high longevity so your recipient will be able to enjoy their flowers for many more days to come. The flowers our Cruden Bay Florists are supplied with come in many shapes, sizes and colours so all of our bouquets are incredibly eye-catching and unique in their own way. Our Cruden Bay Florists weave together flowers and leaves, such as pittos and eucalyptus, in a balanced harmony to create a perfectly rounded bouquet body which is then finished off artistically with tissues, papers or ribbons. Alternatively, our Cruden Bay Florists can arrange your flowers into a lovely vase, box or even a teacup depending on what you're looking for. 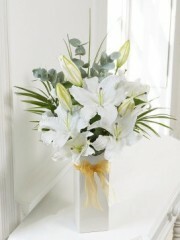 Once the bouquet has been arranged, our customers have the choice to add a personal message for your recipient. Our Cruden Bay Florists want nothing more other than to provide you with the most amazing bouquets for you to give to your recipient.